The tense and fascinating history of the collection of human remains at American museums. This past week was the last for my online Antiquities Trafficking and Art Crime course. Dedicated to the difficult and divisive issue of the return of cultural objects, I and the students grappled with tough cases and differing world views. Human remains were, no surprise, a particularly contentious topic. Using the case study (and ongoing controversy) about the Kennewick Man/Ancient One skeleton as a starting point, I asked the students how they would feel if their great grandfather’s remains were locked up in a box in a museum. You can guess there was a sharp divide. Some felt that the continued presence of looted or stolen human remains in museums was among the gravest of injustices that we faced during the course. Others were shocked that anyone would really care what happened to their body after they died, and argued that science must always win out against some individual’s feelings. Most wanted more information on the topic. Background. I don’t blame them, human remains are hard. I wanted more background too. 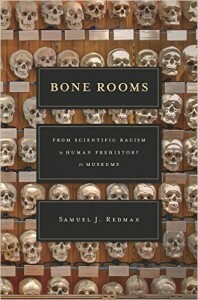 As chance would have it, the book I was reading that week was Bone Rooms by Samuel J. Redman. 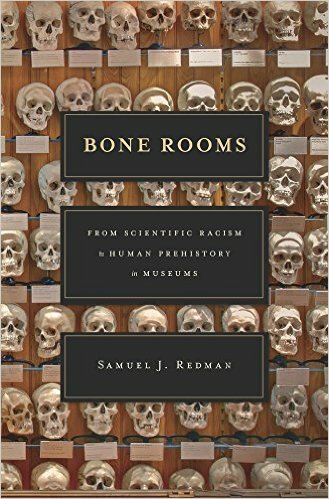 Bone Rooms covers the growth of bone collections in US museums from the 19th into the 20th century; how curiosity about race and human prehistory (separate or intertwined) played out as bones in boxes and outright robbing of Indigenous graves. To the students who were asking “how did we get into this human remains mess” I highly recommended Bone Rooms. And now, to all of you, I highly recommend Bone Rooms. Before I go into the very specific bits, let me say Bone Rooms is a great read. I really liked it. There is nothing that I like more than sitting in a pub on a Sunday afternoon, drinking a pint, and reading about an American Civil War Soldier, a battlefield amputee, visiting a medical museum and finding his own arm on display. HIS OWN ARM. Redman book has a narrative with a few clear characters who moved through time and who deal with changing social and academic standards in various ways. How does a white bone curator who only years before claimed that blacks have only 80% the mental capacity of whites react to a black physical anthropologist entering the research scene? How does the black scholar react? Go read Bone Rooms. Now the specifics. This is a website about antiquities crime after all. Redman’s recounting of incidents of bone looting were shocking and useful. Well useful for me. In the American southwest in the very early 1900s, the scholars kicking around the area noted massive amounts of looting of archaeological sites. Although there was some skull taking during this looting, the scholars believes that the looters treated human remains to be detritus that was just tossed aside. The scholars took it upon themselves to salvage the looter-damaged bones, and at times bought bones from looters. And this is exactly the time period that everyone starts to freak out a very little bit about the destructive nature of archaeological looting in the Americas. As scholars started to let go of the idea of a totally static Native American past, and when American prehistory began to extend into deep time with changing cultures, archaeological sites and ancient burials came to represent what could be seen as the only record of past humanity. Looting, then, destroyed that record which couldn’t be recovered from hassling some modern Indigenous people in the name of science. Salvage, then, was the name of the game. The human remains needed to be saved to save prehistory. Speaking of prehistory, Bone Rooms presents forth an interesting idea, a tension that I hadn’t fully thought through before. That the academic need to understand race as it was conceived of at the time stood, in some degree, in opposition to the growing academic need to understand human prehistory. In the first, collecting and studying bones would, it was thought, lead to defining the physiological differences between human populations based on structured frameworks of perceived race. In the second, collecting and studying bones would reveal information about human evolution and prehistory based on a framework of gradual or drastic change over time. Focusing on race as an unchanging static thing creates a present and a past which are one. Focusing on prehistory as related to evolutionary (and later cultural) change and development created a present that is related to the past but different from it. In other words, each accepts a fundamentally different mindset for answering the two burning questions: “Who are we?” and “Who are they?”. This isn’t the only tension that Redman identifies. I was fascinated by the odd relationship between museum’s collecting bones and museums displaying bones. There is a solid belief among the intellectuals at the time that the general public should benefit from the educational value of museum bone collections but also a fear that people would be upset at the sight of human remains. The author clearly shows that the public loves to look at bones, citing the popularity of Barnum-esque for-profit ventures, medical museums, and mummies. Yet the powers that be somehow imagined us all a bit to dainty for that kind of thing. He identifies a handful of exhibitions of human remains from the time and compares that to certain individuals’ willingness to put bones on display. Enthusiasm and ideas don’t lead directly to public bone rooms. Bones, then, seem to become the most private of museum holdings. Many scholars of the period who were concerned with collecting bodies for science simply could not imagine weighing the religious, spiritual, or cultural rights of indigenous peoples against the goals of science. Many scholars of today can’t. This is not resolved. We aren’t solid on this. Not only are museums dealing with the controversial human remains collecting decisions made by the researchers in Redman’s book, they are dealing with the continued unrest over recently recovered bodies, especially those from the very distant past. We don’t know if science or culture wins, our decisions about it are inconsistent, and everyone walks away upset. Sure, Bone Rooms is concerned with actions of a century ago, but those actions are directly relevant not only to modern academic debate, but practical decisions being made right now by museums, communities, and courts. I think Bone Rooms is a useful addition. It gave me a foundation for this topic that I sorely lacked. Should you buy Bone Rooms? I’d say so. It is more academic and a lot less pop history, but you, fine readers, are smarties. You can take it. Should you get your Uni Library to buy it? Absolutely. Useful for several disciplines. Fill out the request form.